The way that I remember it, Al Green just did not come up in conversation. I started noticing his name in some of the music journalism that I was reading, but nobody mentioned him before that. Or, if they did, the name didn’t stick. I didn’t notice him being played on the radio. But then I must have hit critical mass on hearing about the man and so I decided to find out what I had been missing. I wandered down to the basement location of Haffa’s records. Ron owned the place and he became something of an older brother who watched over me. He went so far as to let me run the place every now and then. 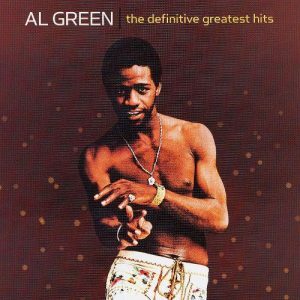 Of course, he had a copy of Al Green’s greatest. I would like to claim that I knew immediately that I had stumbled upon greatness. I probably expected the muscle of Atlantic stars like Aretha and Sam & Dave or the drive of Motown. This was something else. That voice… that incredible voice. And the songs grooved. I have always been known to turn on guests and inflict something I want them to hear and love. Not everyone agrees with me, but usually someone in the group gets that lovely look on their face that indicates recognition. Usually, I want to dust off my hands and retire from the room, announcing, “My work is done here.” This has worked for Jonathan Richman and The Raspberries, Berlioz and Roland Kirk. I’m saying that it works within a few minutes. That has never been the case with Al Green, I am sorry to say. Absolutely, the look arrives, but it takes about a half hour- six or eight songs. On the other hand, I could be walking around with someone a week later. A lull happens in the conversation. I notice that they are ever so softly singing Call Me or Love and Happiness. Of course, there is also this, which is just… well… words fail me. Lastly, let’s be clear that this is the original version by the guy that co-wrote the song with Mabon Hodges. You’ve Got to Check This Out is a blog series about music, words, and all sorts of artistic matters. It started with an explanation. 77 more to go.